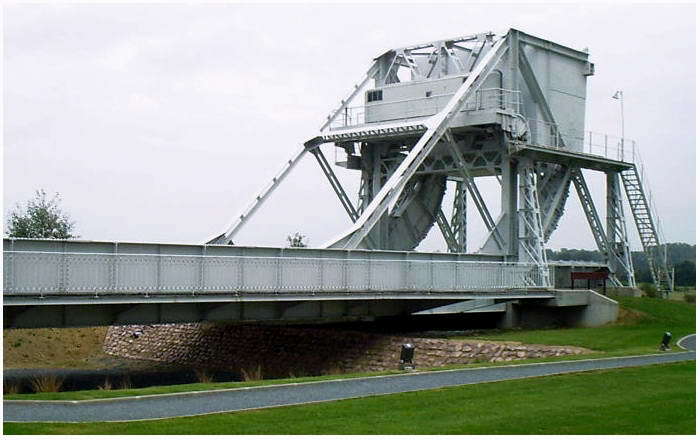 THE TOUR BELOW TAKES YOU TO THE FAMOUS BRIDGES ACROSS THE CAEN CANAL "PEGASUS BRIDGE", AND THE RIVER ORNE. 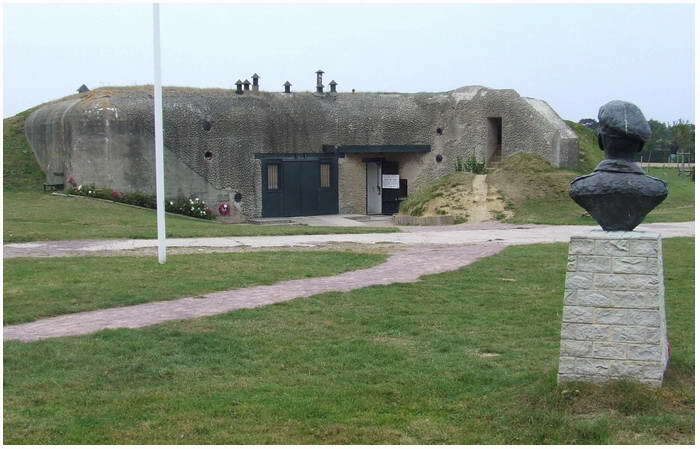 NEXT WE DRIVE TO MERVILLE TO VISIT THE BATTERY COMPLEX. THESE TWO OBJECTS WERE TARGETS FOR THE 6TH AIRBORNE DIVISION. FROM BAYEUX TAKE THE N13 TO THE EAST, DIRECTION TO CAEN. FROM CAEN (D515) HEAD FOR OUISTREHAM. FOLLOW THE SIGNES TO BENOUVILLE/RANVILLE (D514) "PEGASUS BRIDGE"
(PEGASUS) BRIDGE OVER CAEN CANAL. 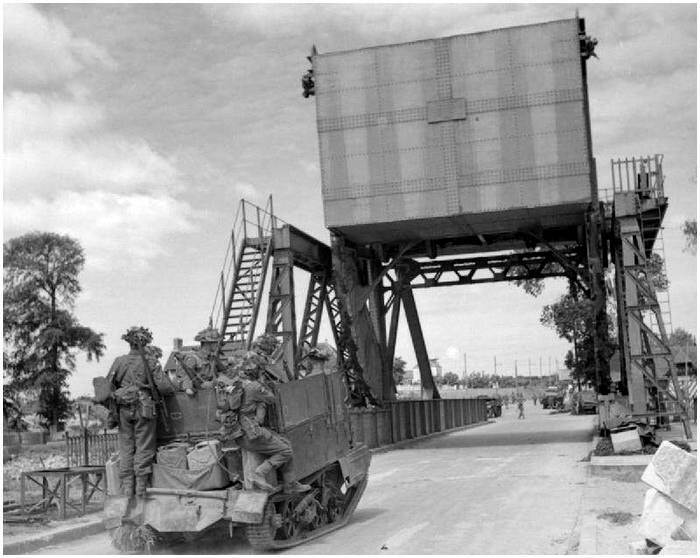 The first bridge you pass is the bridge over the Caen canal. 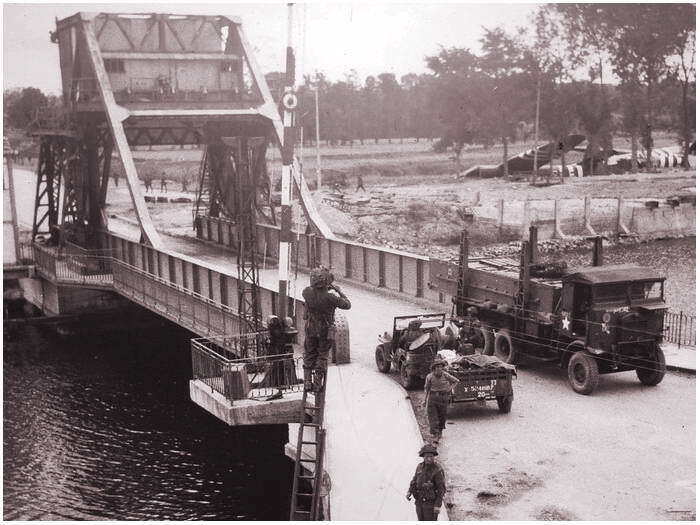 This is the famous Pegasus Bridge. A couple of hundred meters further is the now called 'Horsa Bridge'. Near the Pegasus Bridge landed three 'Horsa' gliders of the 6th Airborne Division under leadership of Major John Howard. 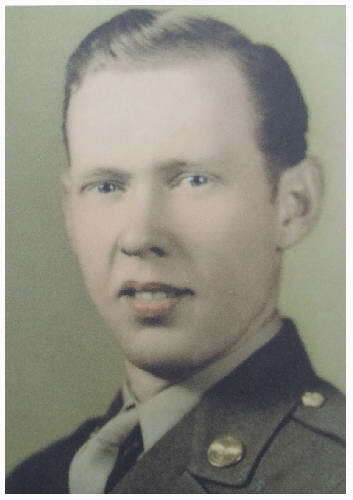 They came down on the east bank 16 minutes after midnight on June 6th, 1944. Within 10 minutes the bridge had fallen into D Company their hands and was secured. Within in the British troops, there were 2 killed and 14 wounded. The owners of café Gondrée, on the west bank, became the first French who were liberated. On the landing side stands a bust of Major Howard and there are marker stones were the gliders came down. The bridge at the Orne river was taken by two other platoons of D-Company without hardly a struggle. Howard had to 'hold until relieved'. Just before daybreak there appeared a couple of German tanks around the corner at the maire Bénouville. 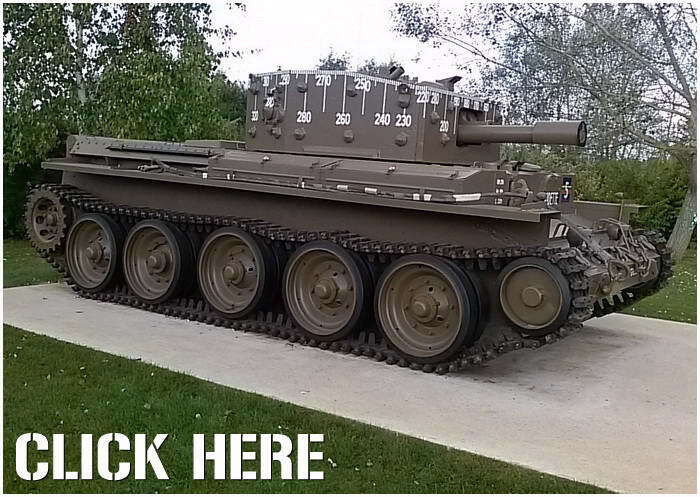 With a PIAT (Projector Infantry Anti-Tank, a grenade launcher as one is displayed in the museum) the first tank was put out of action by sgt. Wagger Thornton. The other tanks pulled back. All the while D Company was at the bridge it was fired upon by mortars and snipers. The suspicion rose that it was controlled from a big building on the west shore, the Chateau de Bénouville, a women maternity. Private Wally Parr had meanwhile figured out the working of the German 5cm anti-tank gun, that was placed in an open bunker next to the bridge (it is still there). He began shooting at the building. After a while Howard stopped the shooting, because it was of no use. To the right of the building stood a watertower and they figured there could be snipers up there. So, Parr asked permission to fire at the tower. This granted, he began shelling it. Because he shot armoured piercing shells, they went straight through the walls of the tower. Every hit created a new stream of water from it. After a while Howard stopped shooting at it (the tower was torn down after the war). Around 10.00 hours a German plane dropped a bomb, which hit the counterbalance of the bridge, but it did not detonate (the damage is still to be found at the bridge in the museum). 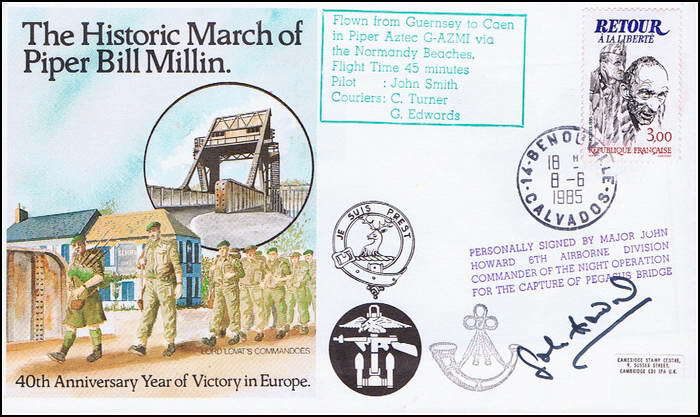 At 17.00 hours that afternoon the bagpipes of Bill Millin could be heard when Lord Lovat came with his relief troops. In 1961 this area was one of the locations for the motion picture 'The Longest Day', when the whole attack and relief was re-enacted. Leave the (new) Pegasus Bridge and head eastwards for the Memorial Pagasus Museum. The museum is located on the piece of land between the two bridges north of the D514. Here you'll find the restored original bridge that was replaced by a new one in the early nineties. In the large counterbalance at the back of the bridge, you can still see the bruises and holes when the bridge was struck by the German bomb. Also on show are a Bailey bridge and a replica of a Horsa glider. In a small shed are original pieces of a Horsa on show. In 2014 the Centaur IV which stood for years across the road from the café of the family Gondrée, has been moved to the museum. Of this type, with 95mm gun, 80 were built and were deployed by the Royal Marine Armoured Support Group to operate from LCT's in support of the landing parties. 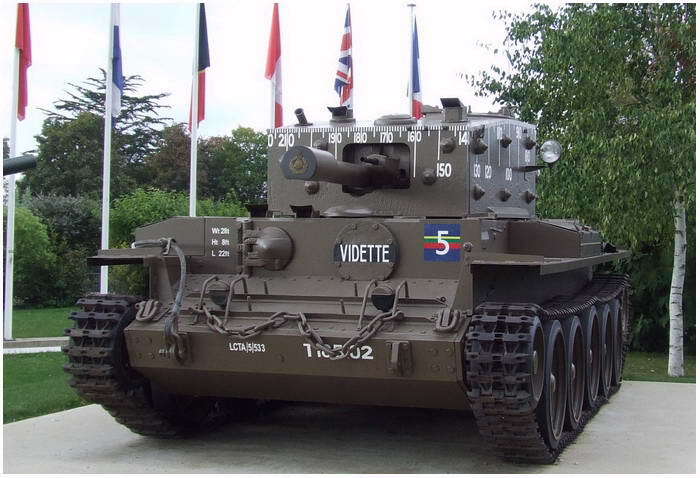 To coordinate the shots at targets, the turret had markings to line the gun towards them. The LCT's were in the waves no steady platform, and the Centaurs were dropped onto the beaches instead and started their work from there. (Opposite the café, on the spot where once the Centaur IV stood, is now a Bofor AA gun to be found). FROM PEGASUS BRIDGE TO RANVILLE (D 514). The two bridges were taken just after midnight on June 6th, 1944. It is a short drive towards Ranville. Take the first roundabout after the the bridge across the Orne (the second one and on June 6th, 1944 known as 'JAM') and head for Mervill/Franceville. After a few hundred meters, after the slow corner, make a stop on the right-hand side of the road near the small monument. This point was one of the LZ's (landing Zone) for the gliders. To the south of the monument one Horsa made a landing on the V-shaped field. But most of the gliders landed north and east of this point. Turn sharp right and head for Ranville. In front of you, appears the detached belltower of the church of Ranville. 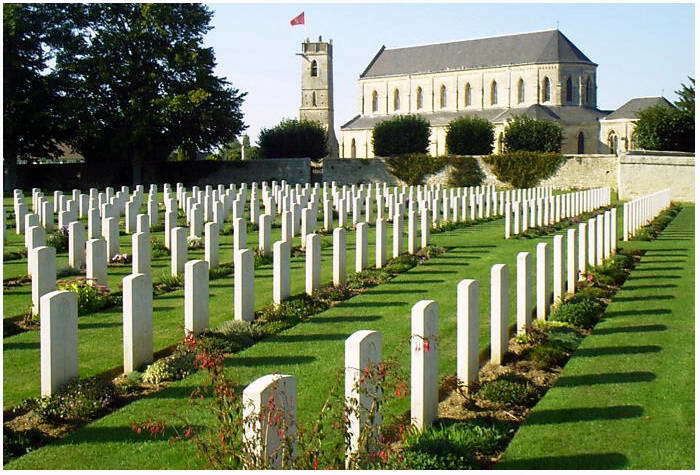 Behind this church is the war cemetery for mainly the 6th Airborne Division. There are 2563 white markers on this site. Behind the northern church wall are a few men buried that were killed in the first two days of the landing. 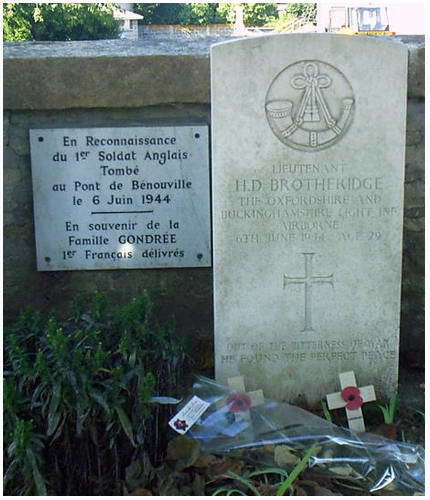 Among them Lt. Brotheridge, who was one of the first soldiers to die on that day. He was killed near the Pegasus Bridge. The family Gondrée, owners of the Café near the bridge, honoured him with a plaque. Here at the churchwall is also a lonely grave of an unknown German soldier. East of the church is a boy-and girl school. 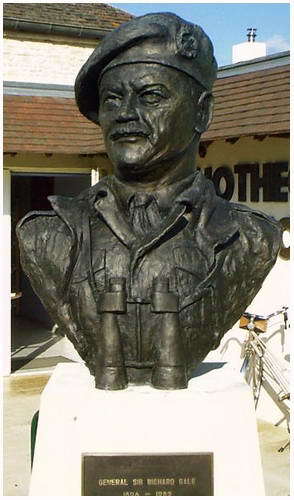 On the far site, near the libary stands the bust of Major-General R.N. 'Windy' Gale. 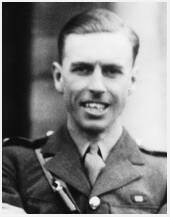 Gale, commander of the 6th Airborne Division, was flown in by glider around 03.30 hours and he put up his HQ in Ranville. On the way to Ranville, he confiscated a white horse and made good use of it. One day it saved the live of Gale when it stood between the General and a falling mortar shell. 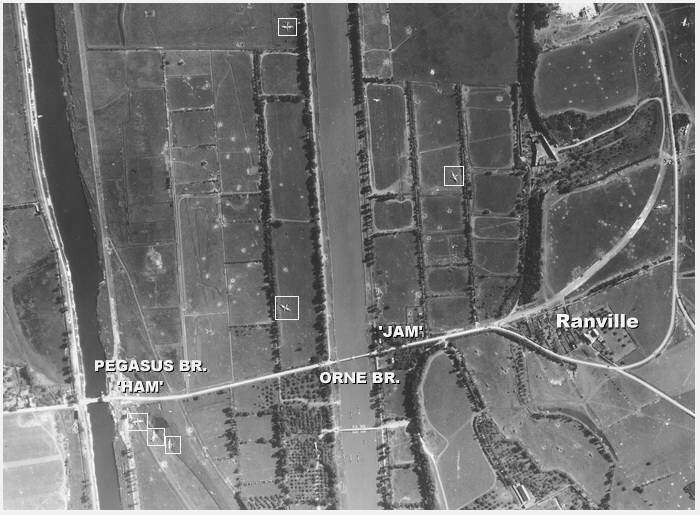 Ranville was heavily attacked by the German forces, and when Lord Lovat reached the Pegasus Bridge that afternoon, he and his man were directed to Ranvill. Six days later Lovat was seriously wounded during an attack through Amfréville. CONTINUE THE ROAD NORTH, TOWARDS MERVILLE/FRANCEVILLE AND CABOURG (D 514). On your way to Merville, you can make a small detour through the lovely little town of Amfréville. Central in the town stands the impressive church. Because a couple of roads ran into this town, it was a important tactical crossroad. 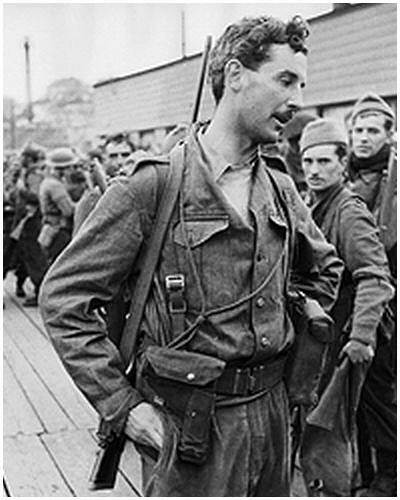 After the liberation of Amfréville on 6 June by the 6th Airborne, the 4th Commando from Kiefer took it over from the British paratroopers. After a heavy battle on 8 June, around Bréville, Lord Lovat had to pull back to Amfréville and spent the night with his men in the church. 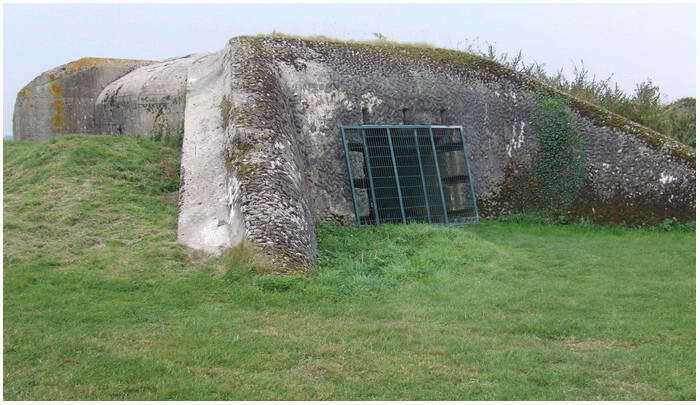 Just in the south, outside Merville, lies the battery complex that the Allies were afraid off because the bunkers were to contain 150mm cannons that could be a danger for the invasion fleet. 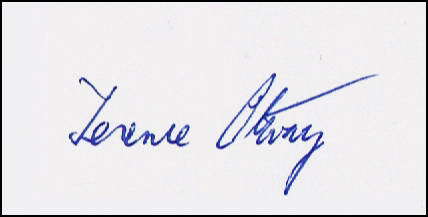 The task to silence the complex was given to Major Terence Otway. Lancaster bombers dropped bombs just after midnight on the battery. Unfortunately the bombs missed the target. 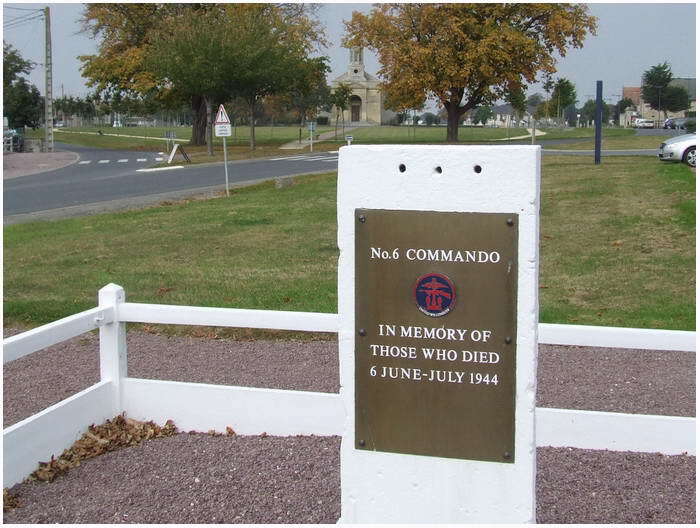 Four hours after the paratroopers of the 6th Airborne Division landed Otway collected 150 men and did head for the Merville. This was just 25% of the men that made the jump. The most of them were hopelessly lost or were dropped at the wrong point. The attack started at 04.20 hours which was fierce and bloody. Seventy British soldiers were killed or wounded. At the German garrison twenty were captured, the other Germans were killed or wounded. At 05.00 hours it was all over. In the bunkers were not the dreaded 150mm but some 100mm Skoda cannons. 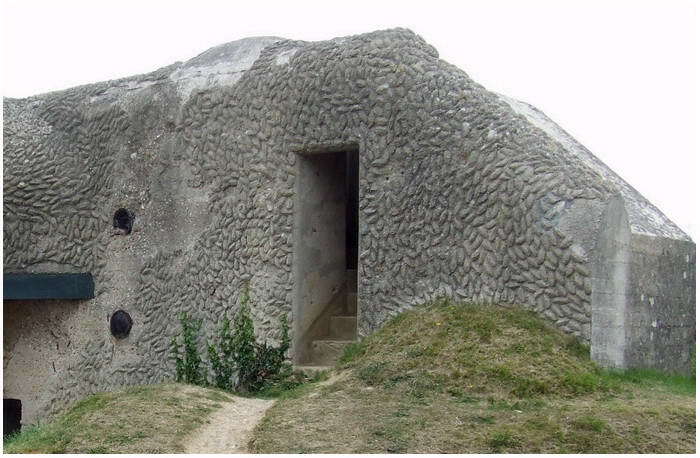 After Otway and his men left the site the battery was once more taken by the Germans. The next day there was again hefty fighting in the bunkers and the tunnels that connected the bunkers. In the first casemat, the biggest of the battery, an impressive sound- and light show is presented. When the green light near the entrance is illuminated you may enter the casemat. The ‘show’ is in two parts. The first segment consists of the shooting of the heavy gun at the invasion fleet. Around the gun stand a couple of German (puppet) soldiers. The enormous noise might frighten little children and the smoke makes the environment very sinister. The second part is the attack by the para’s under the command of Otway. Beside the show, there are a few small rooms with diorama’s which shows how German troops lived in this casemat. The British paratroopers who made the attack on this battery are the focus of the exhibition in the second casemat. 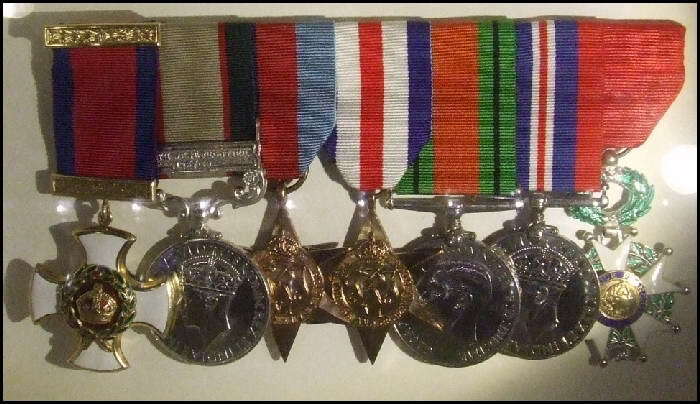 There are some personal items on show, such as documents, pictures and medals. Also in this casemat are small diorama’s which show how the British para’s did their work over here. There are some broken pieces of concrete, but extreme evidence of damage by fighting is scares. What obvious is how the casemats are built. The outer skin has a very interesting pattern of camouflage. The big commando bunker can not be visited and stands knee deep in water. On this bunker some evidence of the fighting is noticeable, bullet holes in the concrete and grenade blasts around the entrances. The command bunker had a periscope in the roof. During the attack in the night of 6 June, Stabsfeldwebel Buskotte looked through the periscope when a British paratrooper took a shot at it and made it unusable. 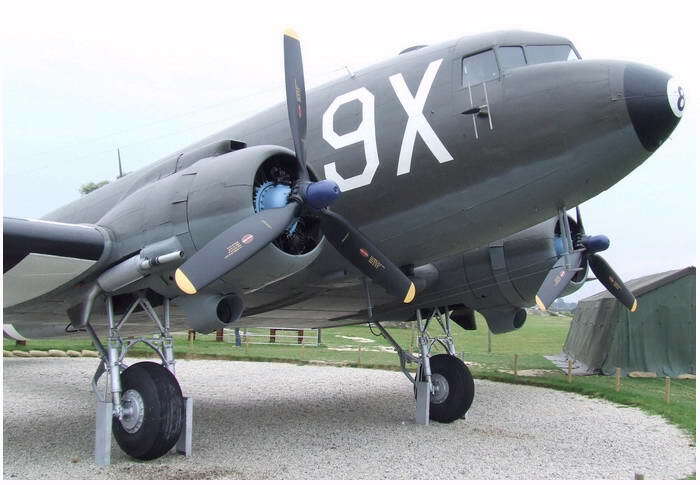 In July 2008 an original C-47 was placed at the museum. This Dakota, the 43-15073, brought in the night of June 5-6, 1944, paratroopers from the 501st PIR, 101st Airborne Division, to France where they jumped south of Ste-Mère-Eglise. 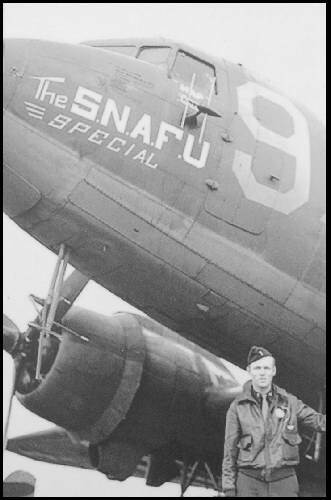 In September 1944 she brought troops from the 82nd Airborne to Holland during Operation Market-Garden. On 27 December, 1944 she was hit bad by German Flak over Bastone during the battle of the Bulge. The crew almost went down with her, but escaped with their lives. After the war she was in service with the Czechoslovakian airlines and later in the French Air Force. After that she was sold to the Yugoslavian A.F. and saw action during the Baltic conflict and was badly damaged by machine gunfire. She was saved from the axe and completely restored and is placed as a memorial at the museum in Merville.